When I was in Houston last month Carmen got in her craftroom closet and pulled out some of her goodies to share with me. 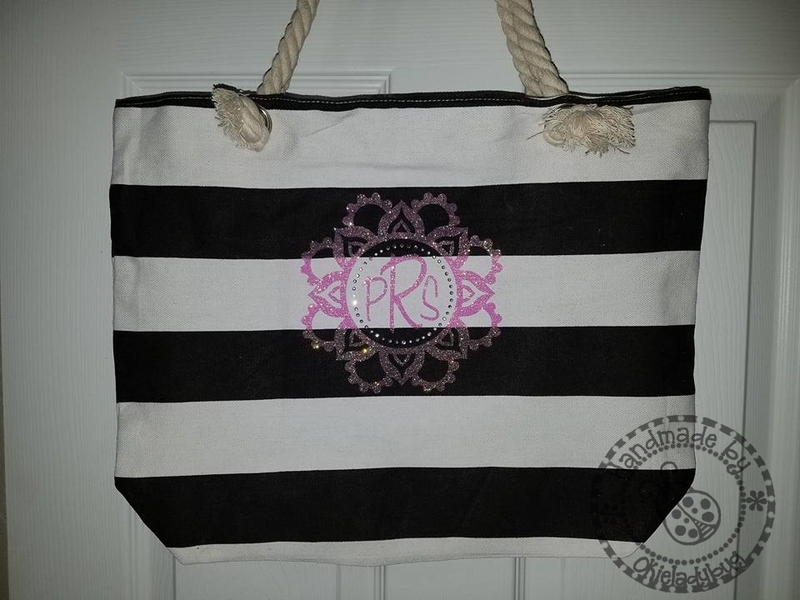 One of the things she shared was some canvas totes and I knew my daughter would want one because she has an addiction to such things. I wanted to do something with HTV on the tote but wasn't sure how to do it or what to put on it. I remembered Carmen had made a mandala file and I thought that would be nice with my daughter's initials. The tote is white and navy stripes and I wanted something sparkly so I sacrificed some of my glitter HTV *okie figures her daughter is worth the sacrifice*. I was able to use MTC to make a rhinestone template, simply because you can never have too much bling. I had to ask on Facebook about settings for using HTV on canvas and I was still nervous about trying it *okie wonders why she is always scared she is going to mess something up*. Luckily I was able to get everything cut and pressed on to the bag. The pink glitter doesn't show as nicely on the navy as it does the white but my daughter was still very pleased with the tote. I still have two more of these totes and not quite sure what I will do with them yet but I hope it is something fabulous! Nice tote, I'm sure you will come up with some fabulous to do with the others! Ohhhhh ... 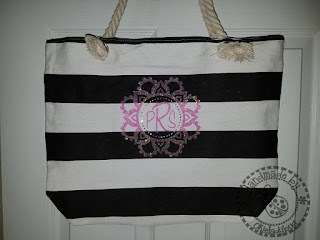 I love this tote. The design is fabulous, and I love the bling. What a great size too. This is something I would use a lot and I can see why your daughter was so pleased with it ... I love it too!